A city dog goes to the country and experiences the sun, trees, and fields. The city dog runs, barks, and realizes the differences between the city and country. 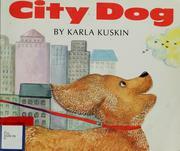 Kuskin, Karla, “City dog,” Children's Picture Book Database at Miami University, accessed April 18, 2019, https://dlp.lib.miamioh.edu/picturebook/items/show/8641.